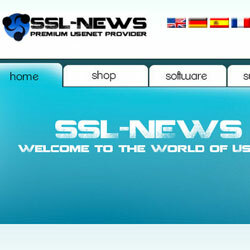 SSL News is a provider that offers premium access to Usenet network. Following our tradition, we post discount coupon codes once we will be notified about newest offers. - account sharing: you can share with your account with friends and use the access from different locations and IP addresses at the same time. This will save your money. The Usenet packages are divided into Flatrate and Block account. If you download much then flatrate premium account is the right choise for you: choose your download speed between 5 and 150 Mbit/s. If you just wish to download some files from Usenet network then you can think about saving money through ordering of a block account: you have a choise between blocks from 4 GB up to 1,000 GB of traffic volume. Please consider that the offer is limited, so if you really wish to get the discount then I would hurry up.